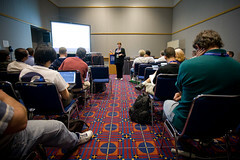 Aug 4, 2010 - UCOSP goes to OSCON: how is open source doing in academia? OSCON brings together people like you from across the open source universe to learn, inspire each other, and collaborate. If our mission is to get students working on cool open source projects, what better place to look for mentors? In addition, we were interested in how other people are teaching open source software in academia. Luckily, OSCON had lots of people with something to say on the topic. Why don’t more instructors teach open source? For faculty, incorporating open source into the curriculum often doesn’t fit the reward system which favours research over teaching. Even when teaching is valued, professors have such high workloads that they might prefer using conventional courses where the exercises come from a textbook and exams can be reused. With open source projects, stuff happens—a mentor might get busy, progress is hard to measure, or the project might run into technical obstructions. How is grading done? How can efforts scale to involve more projects? And how can initiatives handle the risk of being dependent on a lone professor for sustainability? These are just some more of the challenges of bringing open source into academia. And it’s also challenging for students. Many students don’t have a background in the tools and processes of open source projects—they might now know how to use version control systems or compile a complex project, for instance. Equally important, they might not be familiar with communication conventions like how to behave on a listserv (in particular, knowing how not to get flamed). The conventions of normal universities often don’t mesh well: whereas open source culture promotes collaboration, students have been trained not to copy from each other. Also, organizing students into groups and assigning them to work on projects doesn’t reflect the open source model of self-organization. if there are so many challenges, why is it worth doing? Working on open source projects supports professional learning, broadens the interests of students, and gives them an opportunity to make a meaningful contribution in their field. It also strengthens the bonds between academia and industry and creates pipelines of students into open source software projects. And even if students don’t contribute much, they can observe the process of how software is created. Open source projects live or die based on whether they can foster a healthy community. If a project isn’t welcoming for students, chances are, it’s not welcoming for anyone and thus its long-term success is uncertain. Humanitarian FOSS. An organization that builds free and open source software to benefit humanity. UCOSP. That’s us! On the screen, Mel put the phrase: ‘The culminating experience of one’s undergraduate is an NDA.’ In contrast to work done on co-op, UCOSP gives students an opportunity to work on something that they can easily show off. POSSE. A week-long bootcamp that immerses professors in open source projects so that they can learn how to get their students involved. Teaching Open Source. An online community for anyone interested in teaching open source in schools. Don’t forget to sign up for the mailing list. Sugar on a Stick: A customizable learning platform that fits on a USB thumb drive. And the engineering team is led by a high school student!